The Welsh folk song David of the White Rock (Dafydd y Garreg Wen) has been arranged for viola solo and piano by the world-famous violist Donald McInnes, who held a professorship at the University of Southern California from 1985 to 2014 and is known in virtually every corner of the artistic world for his appearances with major orchestras, recitals, chamber music participation, and numerous master classes. David Owen, the famous blind harper and composer, lived near Porthmadog in Caernarfonshire, Wales in the first half of the 18th century and was known locally as Dafydd y Garreg Wen (David of the White Rock). The epithet Y Garreg Wen (English: The White Rock) was the name of the farm near Morfa Bychan in which he lived. Tradition has it that as Owen lay on his deathbed, he called for his harp and composed the haunting air. The words were added nearly a hundred years later in by the poet John Ceiriog Hughes. 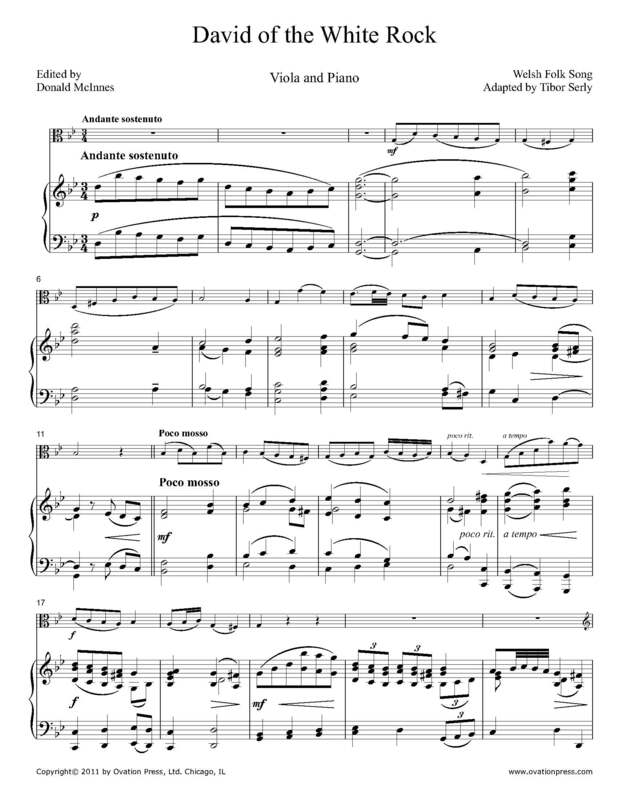 Download and print the score today to gain access to this expertly edited arrangement of David of the White Rock for viola and piano by Donald McInnes! Click here to listen to a recording of Donald McInnes performing David of the White Rock arranged for viola and piano. Ceisiaf cyn marw roi tôn arni hi. "Dafydd, tyrd adref, a chwarae trwy'r glyn!"